Karim Benzema scored his 200th Real Madrid goal as his team beat Viktoria Plzen 5-0 and move closer to the knockout stages of the Champions League. Madrid recovered after a shaky opening 15 minutes, in which the hosts smashed the crossbar and Sergio Ramos went unpunished for an elbow on Milan Havel, to break the deadlock through Benzema's fine solo landmark goal, and from here Real took control of proceedings. Three minutes later Casemiro doubled the advantage with a simple headed finish from a corner, and another set-piece proved the Czech champions' undoing as Benzema prodded home to make it three shortly after. Gareth Bale hadn't scored since September 19, but the Welshman rounded off a spectacular first-half display with a lovely volley to end his mini goal-drought. The end-result could have been anything Real wanted it to be, but the reigning European winners took their foot off the gas after the restart, adding just one more goal, Toni Kroos nonchalantly lobbing the ball over the goalkeeper from close range. 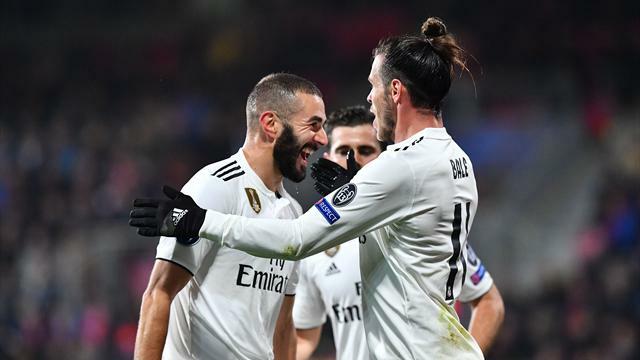 The victory moves Real Madrid top of the pool, level on points with Roma who earned a 2-1 victory over CSKA Moscow in the day's earlier game, with only two matches remaining. TALKING POINT - Will this result propel Santiago Solari into the hot seat at Real permanently? Before kick-off there had been strong rumours circulating that the 42-year-old caretaker manager would be handed the job on a permanent-basis if Real were able to win by a convincing margin. And that they did. The hierarchy has been unable to land the glamorous name the fans crave - Mauricio Pochettino and Antonio Conte were targeted, but neither move will likely materialise - and it appears they will be forced to look elsewhere. Having reversed a horrendous run of form - winning all three of his games in charge without conceding a goal - Solari is now the leading candidate. Everything he touched turned to gold, the German international registering a sumptuous goal and two assists to his name. Viktoria Plzen: Hruska 6, Limbersky 5, Hubnik 5, Hejda 5, Reznik 5, Prochazka 5, Hrosovsky 5, Kopic 6, Cermak 6, Havel 5, Chory 6. Subs: Horava 5, Petrzela 5, Reznicek N/A. Real Madrid: Courtois 6, Ramos 7, Nacho 7, Odriozola 6, Reguilon 6, Kroos 9, Casemiro 8, Vazquez 7, Ceballos 8, Benzema 8, Bale 8. Subs: Isco 6, Vinicius Jr 6, Sanchez 5. 6' - OFF THE CROSSBAR! Real Madrid's defence is all over the place! Plzen are extremely unfortunate not to be ahead. Hrosovsky is played through on the left and he has all the time in the world to pick his cross. He fires it across the face of goal, it hits Nacho, could go anywhere, but cannons off the woodwork and bounces to safety. 13' - OUCH! This is nasty. Ramos catches Havel with an elbow to the nose, and with some force too. Could be broken. 20' - GOAL! Viktoria Plzen 0-1 Real Madrid: BENZEMA! They have been under the cost of large periods of the game, but Madrid take the lead! And it's a lovely solo effort by the Frenchman. He receives a forward pass from Kroos, and with beautiful close control he slaloms his way past a couple of defenders before sticking the ball between the goalkeeper's legs. Goal 200 for Benzema at Real Madrid. 23' - GOAL! Viktoria Plzen 0-2 Real Madrid: And there is number two! It's terrible marking from a corner by the hosts, Casemiro is left unmarked and he has the simple task of heading Kroos' whipped delivery past the goalkeeper. 37' - GOAL! Plzen 0-3 Real Madrid: School-boy defending. Another set-piece, another Real Madrid goal. The visitors take a short corner to Ceballos who floats in a cross to the back post. Bale rises highest, flicking it onto Benzema who is left totally unmarked to prod it home. 40' - GOAL! Plzen 0-4 Real Madrid: BALE! He needed that, but this is becoming embarrassing for the hosts. It's another simple goal: Ceballos whips in a cross, it skims off Benzema's head and lands at the feet of Bale who volleys it past the helpless goalkeeper from an acute angle. 67' - GOAL! Plzen 0-5 Real Madrid: How about that?! Delicious goal by Kroos, but it's made by the promising Junior. The young Brazilian drives forward, eating up a lot of ground and then slips through Kroos. And the German international scoops it nonchalantly over the head of the goalkeeper and into the back of the net. Santiago Solari is the second Real Madrid manager to win his first three games without conceding a goal (Luis Carniglia in 1957). Toni Kroos was directly involved in three goals in a single Champions League match for the first time in his career. Karim Benzema scored his 200th goal for Real Madrid in all competitions, becoming the seventh player to reach this tally for the club. Thibaut Courtois is the fourth player to play for both Real Madrid and Atletico in the Champions League (Juan Esnáider, José Manuel Jurado and José Antonio Reyes).